The lightning delays and eventual cancellation of the University of Nebraska-Akron football game demonstrates how schools can detect or respond to dangerous thunderstorms. "Safety has become a much bigger issue over the years," said John Jensenius, a Maine-based lightning expert with the National Weather Service. "(Schools) are taking action to try and keep people safe." Roughly 300 people are struck each year in the United States, experts say, and more than 30 don't survive. The university's WeatherSentry system detected a strike within 8 miles (13 kilometers) of Memorial Stadium in Lincoln after Nebraska received the opening kickoff. The lightning required a 30-minute delay in play, and subsequent strikes restarted the 30-minute clock. Athletic director Jeff Novotny at Abraham Lincoln High in Council Bluffs, Iowa, told the Omaha World-Herald that he sets his phone app to alert him when lightning is spotted within 30 miles (48 kilometers) of an event. That lets him tell game officials that play might have to be suspended. When the strikes get within about 10 miles (16 kilometers), play is suspended. National guidelines for high schools call for suspending play for 30 minutes if lightning is seen or thunder is heard, said Nate Neuhaus, assistant director of the Nebraska School Activities Association. The 30-minute clock is restarted if lightning or thunder occurs again. Steve Eubanks, supervisor of athletics for the Omaha Public Schools, said a phone app came in handy a couple football seasons ago during a game at Burke High. Lightning was detected, so play was suspended. But the storm soon passed and the game resumed about an hour later. 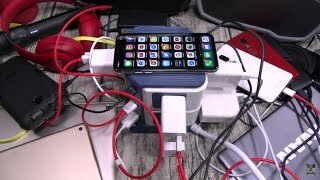 The Last Power Strip You'll Ever Buy!